The PBJ and crew departed on Friday September 28th to attend the Miramar Airshow in San Diego. The PBJ Mitchell bomber will be available on the ramp for static display only from September 28th through the 30th. The public will have an opportunity to tour this one of a kind B-25 and speak with the crew. 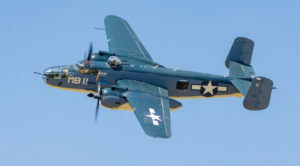 With great appreciation to the airshow organizers for including this unique WWII Marine bomber as part of the highly anticipated Miramar Airshow, we look forward to the possibility of performing at the venue in future shows.